This peanut butter fudge is a favorite in our home – my husband taught me to make it when we were first got together over 8 years ago! Over the years it is still our go-to recipe for peanut butter fudge because it’s rich, creamy, and smooth. Make sure to check out my video below for my Peanut Butter Fudge Recipe – it’s surprisingly quick and easy! You can either grease a dish with butter so the fudge won’t stick or you can line the dish with aluminum foil. The aluminum foil makes for easier cleanup and it’s easier to take out of the dish and cut. After mixing the 1/2 stick of butter, 1 can evaporated milk, and the 4 cups of sugar make sure not to burn the mixture or overheat. Simply melt all the ingredients down in the pot. While the ingredients are melting, combine the rest of the ingredients in a large bowl. After combining both mixtures together, make sure to smooth out all lumps to create a consistent fudge taste throughout the batch. The trick to this peanut butter fudge is the soft ball stage. Once the fudge forms a ball when a drip is placed in a glass of cool water, it’s ready. Of course, you can always use a candy thermometer – I’ve just never had one 🙂 Once it is done, make sure to chill at least 4 hours (I like to let it chill overnight). That it has time to set. It’s worth the wait. The result is a delicious, creamy, tasty treat. This recipe makes up a large batch so it’s perfect to cut into small squares and give as gifts in bags, boxes, or on plates. Follow me on Facebook and Pinterest to stay up to date on recipes! Check out my other recipes here. My husband made me this fudge when we first got together over 8 years ago. The recipe came from his mother and it had been handed down in her side of the family for many years. 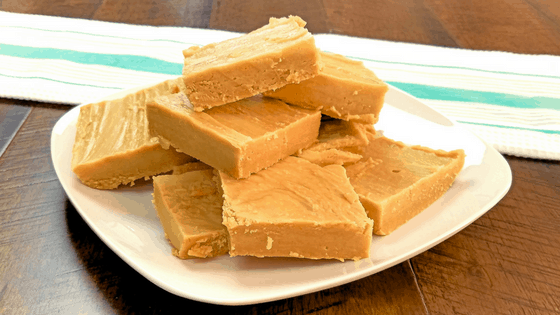 This Peanut Butter Fudge recipe is creamy, smooth, and absolutely delicious! In large pot, mix 1/2 stick of butter, 1 can evaporated milk, 4 cups of sugar. Heat until butter is melted. Do not boil. Add 2 tablespoons vanilla, 2 tablespoons light Karo syrup, 1/2 stick of butter, 16 ounces of peanut butter, and the 1 jar of marshmallow fluff in large bowl. Stir continuously for 10-15 minutes until placing a drip of mixture into a bowl of water will cause the drip to form a ball. Do not overcook! Remove from heat immediately and mix into the large bowl and mix thoroughly. Pour fudge into lined dish and smooth out. Let cool before refrigerating. Let fudge firm in fridge. We make this fudge for special occasions and to give as gifts. Everyone that has tried it has really enjoyed it. Store in refrigerator to keep firm. Enjoy! Check out my Peanut Butter Cup Fudge recipe here! This looks delicious! I’m ready to rush out and buy the ingredients right now, LOL. Peanut butter is always a hit in my family. This would be a real treat for us! This looks so good and easy. Maybe I will be the one who brings the treat to my in-laws house this time. This looks so yummy! This is the perfect recipe to add to my holiday party list. Can’t wait to give it a try!